Rocknest is a sand patch on the surface of Aeolis Palus, between Peace Vallis and Aeolis Mons ("Mount Sharp"), in Gale crater on the planet Mars. The patch was encountered by the Curiosity rover on the way from Bradbury Landing to Glenelg Intrigue on September 28, 2012. The "approximate" site coordinates are: 4°35′S 137°26′E﻿ / ﻿4.59°S 137.44°E﻿ / -4.59; 137.44. "Rocknest" sand patch on Mars (September 28, 2012). The sand patch is downhill from a cluster of dark rocks. NASA determined the patch to be the location for the first use of the scoop on the arm of the Mars Curiosity rover. The "Rocknest" patch is about 1.5 m (4.9 ft) by 5 m (16 ft). On October 7, 2012, a mysterious "bright object" (image), discovered in the sand at Rocknest, drew scientific interest. Several close-up pictures (close-up 1) (close-up 2) were taken of the object and preliminary interpretations by scientists suggest the object to be "debris from the spacecraft". Nonetheless, further images in the nearby sand have detected other "bright particles" (image) (close-up 1). These newly discovered objects are presently thought to be "native Martian material". On October 17, 2012 at "Rocknest", the first X-ray diffraction analysis of Martian soil was performed. 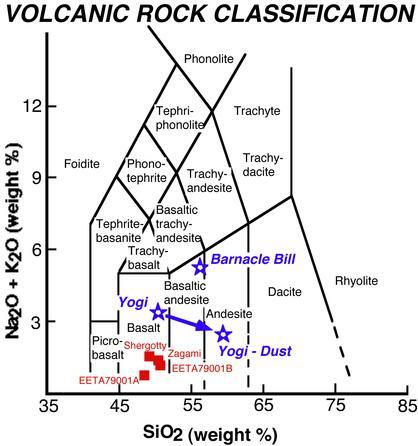 The results from the rover's CheMin analyzer revealed the presence of several minerals, including feldspar, pyroxenes and olivine, and suggested that the Martian soil in the sample was similar to the "weathered basaltic soils" of Hawaiian volcanoes. On September 26, 2013, NASA scientists reported the Mars Curiosity rover detected "abundant, easily accessible" water (1.5 to 3 weight percent) in soil samples at the Rocknest region of Aeolis Palus in Gale Crater. In addition, NASA reported the rover found two principal soil types: a fine-grained mafic type and a locally derived, coarse-grained felsic type. The mafic type, similar to other martian soils and martian dust, was associated with hydration of the amorphous phases of the soil. Also, perchlorates, the presence of which may make detection of life-related organic molecules difficult, were found at the Curiosity rover landing site (and earlier at the more polar site of the Phoenix lander) suggesting a "global distribution of these salts". NASA also reported that Jake M rock, a rock encountered by Curiosity on the way to Glenelg, was a mugearite and very similar to terrestrial mugearite rocks. Curiosity rover self-portrait on the planet Mars at "Rocknest" (October 31, 2012). Curiosity rover wheel marks in the sand patch at the "Rocknest" site (October 3, 2012). 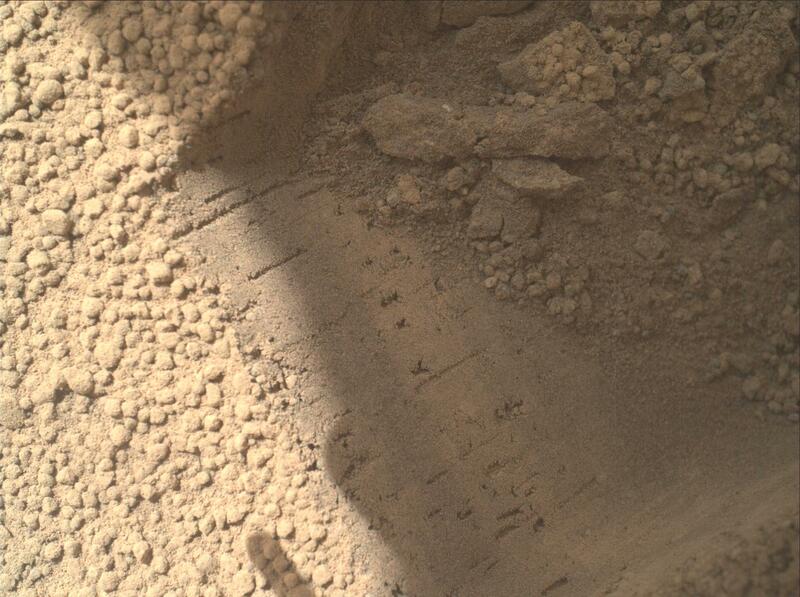 Sand on Mars - scoffmark made by the Curiosity rover (MAHLI, October 4, 2012). First use of the Curiosity rover scooper as it sifts a load of sand at "Rocknest" (October 7, 2012). 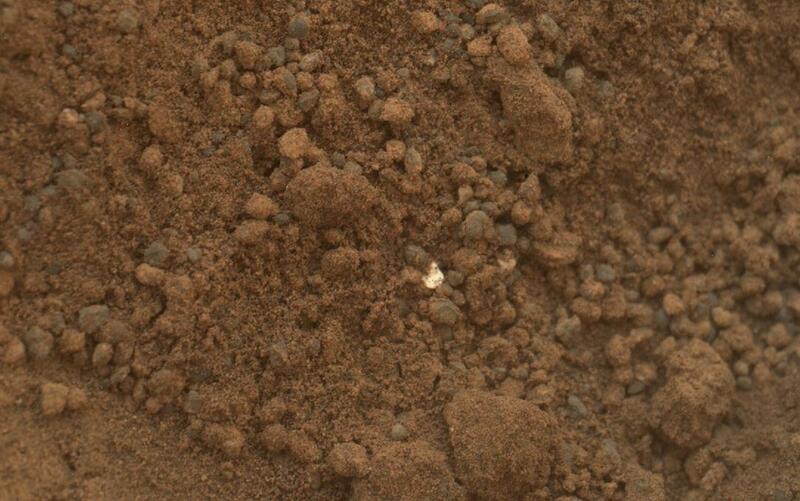 Curiosity finds a "bright object" in the sand at "Rocknest" (October 7, 2012) (close-up). Curiosity rover scoop "bite marks" in the sand patch at the "Rocknest" site (October 15, 2012). 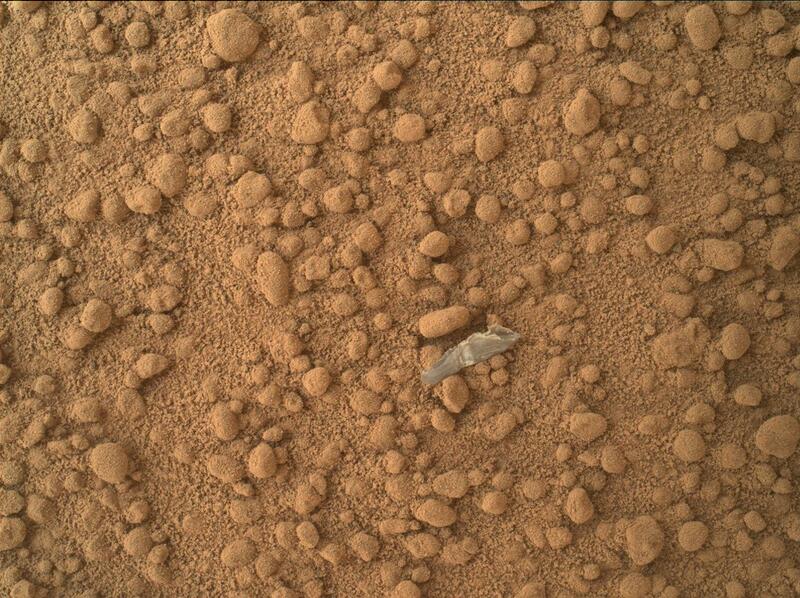 Curiosity rover scoop "soil sample" on "observation tray" at the "Rocknest" site (October 16, 2012). First X-ray view of Martian soil (Curiosity rover at "Rocknest", October 17, 2012). "Rocknest 3" rock - ChemCam and APSX target (Curiosity rover, October 5, 2012) (white-balanced image). "Rocknest 3" rock - ChemCam and APSX target (Curiosity rover, October 3, 2012). Curiosity's view of the "Rocknest" area - South is center/North at both ends; "Mount Sharp" at SE horizon (somewhat left-of-center); "Glenelg" at East (left-of-center); rover tracks at West (right-of-center) (November 16, 2012, white balanced) (raw color) (interactives). Curiosity's view from "Rocknest" looking eastward toward "Point Lake" (center) on the way to "Glenelg Intrigue" (November 26, 2012, white balanced) (raw color). ^ Wall, Mike (October 4, 2012). "Curiosity Rover to Scoop Up 1st Mars Samples This Weekend". Space.com. Retrieved October 5, 2012. ^ a b c Wall, Mike (October 18, 2012). "Yum! Curiosity Rover Swallows 1st Mars Sample, Finds Odd Bright Stuff". Space.com. Retrieved October 19, 2012. ^ a b Staff (October 15, 2012). "Small Debris on the Ground Beside Curiosity". NASA. Retrieved October 15, 2012. ^ a b Major, Jason (October 9, 2012). "Curiosity Finds…SOMETHING…on Martian Surface". UniverseToday. Retrieved October 9, 2012. ^ Staff (October 18, 2012). "Bright Particle in Hole Dug by Scooping of Martian Soil". NASA. Retrieved October 18, 2012. ^ Staff (October 15, 2012). "Bright Particle of Martian Origin in Scoop Hole". NASA. Retrieved October 15, 2012. ^ a b c Brown, Dwayne (October 30, 2012). "NASA Rover's First Soil Studies Help Fingerprint Martian Minerals". NASA. Retrieved October 31, 2012. ^ Lieberman, Josh (September 26, 2013). "Mars Water Found: Curiosity Rover Uncovers 'Abundant, Easily Accessible' Water In Martian Soil". iSciencetimes. Retrieved September 26, 2013. ^ Leshin, L. A.; et al. (September 27, 2013). "Volatile, Isotope, and Organic Analysis of Martian Fines with the Mars Curiosity Rover". Science. 341 (6153): 1238937. Bibcode:2013Sci...341E...3L. doi:10.1126/science.1238937. PMID 24072926. Retrieved September 26, 2013. ^ a b Grotzinger, John (September 26, 2013). "Introduction To Special Issue: Analysis of Surface Materials by the Curiosity Mars Rover". Science. 341 (6153): 1475. Bibcode:2013Sci...341.1475G. doi:10.1126/science.1244258. Retrieved September 27, 2013. ^ Neal-Jones, Nancy; Zubritsky, Elizabeth; Webster, Guy; Martialay, Mary (September 26, 2013). "Curiosity's SAM Instrument Finds Water and More in Surface Sample". NASA. Retrieved September 27, 2013. ^ a b Webster, Guy; Brown, Dwayne (September 26, 2013). "Science Gains From Diverse Landing Area of Curiosity". NASA. Retrieved September 27, 2013. ^ a b Chang, Kenneth (October 1, 2013). "Hitting Pay Dirt on Mars". New York Times. Retrieved October 2, 2013. ^ a b Meslin, P.-Y. ; et al. (September 26, 2013). "Soil Diversity and Hydration as Observed by ChemCam at Gale Crater, Mars". Science. 341 (6153): 1238670. Bibcode:2013Sci...341E...1M. doi:10.1126/science.1238670. PMID 24072924. Retrieved September 27, 2013. ^ Stolper, E.M.; Baker, M.B. ; Newcombe, M.E. ; Schmidt, M.E. ; Treiman, A.H.; Cousin, A.; Dyar, M.D. ; Fisk, M.R. ; Gellert, R.; King, P.L. ; Leshin, L.; Maurice, S.; McLennan, S.M. ; Minitti, M.E. ; Perrett, G.; Rowland, S.; Sautter, V.; Wiens, R.C. ; MSL ScienceTeam (2013). "The Petrochemistry of Jake_M: A Martian Mugearite". Science. AAAS. 341 (6153): 1239463. Bibcode:2013Sci...341E...4S. doi:10.1126/science.1239463. Retrieved September 28, 2013.